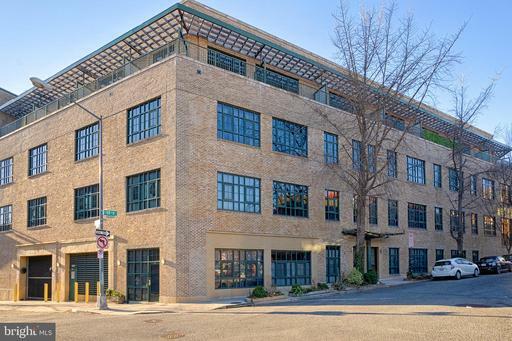 Rare 2BR, 2 bath condo in Delancey Lofts warehouse conversion to urban chic lofts. Exceptionally large 400+sf, private patio is perfect for entertaining or relaxing. Modern, industrial aesthetic features soaring ceilings, open floor plan, warehouse windows, and exposed mechanical systems, brick walls concrete ceilings. Appointments include hardwood floors, stainless appliances, granite counters, marble baths. Dramatic wall space lighting for art. Rooftop terrace with lounging area, gardens panoramic views. Almost 1200 sf of cool, convenient city living in vibrant Kalorama/Adams Morgan. Walk to abundant dining, shopping, parks, outdoor recreation and nightlife. Pet-friendly building with elevator. Deeded garage parking. Entrance on 17th Street across from Harris Teeter.